This addon included free with ScrapeBox will allow you to load a list of keywords, and mass check the number of results for each keyword. This can be great to get an approximation on how much competition there is for a particular keyword when doing keyword research for high paying, low competition niches. You can load a list of brand names or company names to find how many mentions they have. You can also use all the regular Google search operators, for example checking site:domain.com and seeing how many index pages a list of domains has, or intitle:keyword to see how many web pages have a specific keyword in their page title. Once installed you can load a list of keywords from a text file, or from the ScrapeBox keyword scraper. You can also select Broad or Exact match which checks the keywords in quotes. This addon is multi-threaded, and can check the Google competition for 100’s of keywords per minute. It also features randomly rotating proxy support. Once the results are fetched, you can export the data to a .CSV file or to a plain text file for use in ScrapeBox, other software for further research. 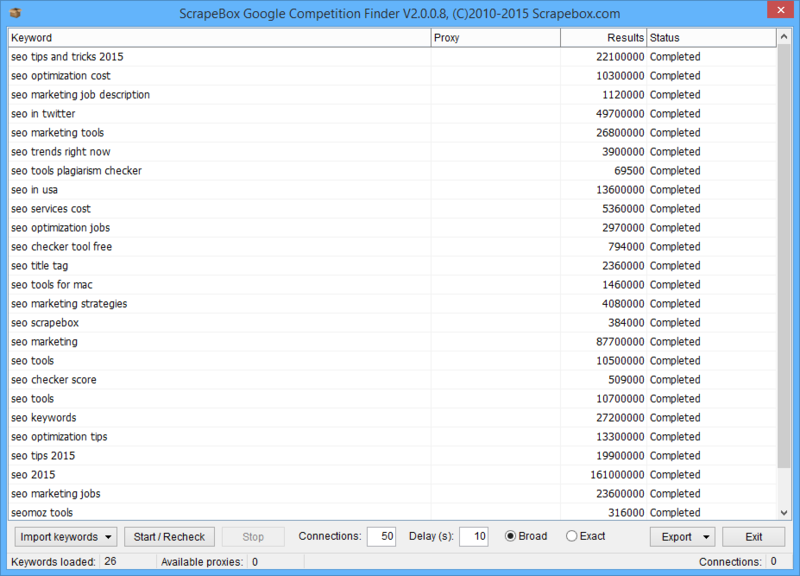 View our video tutorial showing the Google Competition Finder in action. This is a free addon included with ScrapeBox, and is also compatible with our Automator Plugin.